This chicken right here will blow your mind – no really, I’m not kidding. So before I even tell you about it, how it came about, why it’s just so damn good, and even how to make it, I’m gonna tell you this… JUST GO MAKE IT! TONIGHT! I have to admit a little secret to you guys, yes I do love red meat, but I really love chicken more (I feel a halting screech in all your heads as you read this, I’m sorry! Chicken lovers, stand with me here). There are so many ways you can cook chicken and it never leaves you feeling like you just ate a cow and can never move again in your entire lifetime. Last week my cousin Rivka came to visit me from Florida. I don’t get to see her often and she always tells me she wants to try a Beauty and Some Beef creation, so I invited her over. It was pretty last-minute and as I hadn’t been food shopping in a little while the only substantial thing I had chicken in my freezer was chicken. Now if you’ve never tried my food before and this is my début with you, then I really want to make an impression… It doesn’t matter who you are, you could be a 1-year-old or a 100-year-old, a picky eater or a food critic, I’m always going to try my hardest to make sure you enjoy every bite of what I’m feeding you. Anyway, back to the chicken. If your anything like me you have a bunch of things in your kitchen cabinet that you may not use so often, probably some asian style products, but now for the big reveal I’m going to tell you what to do with them and make sure that they are put to good use. This dish is so good that I made 3 pounds of chicken and between four of us it was completely gone. 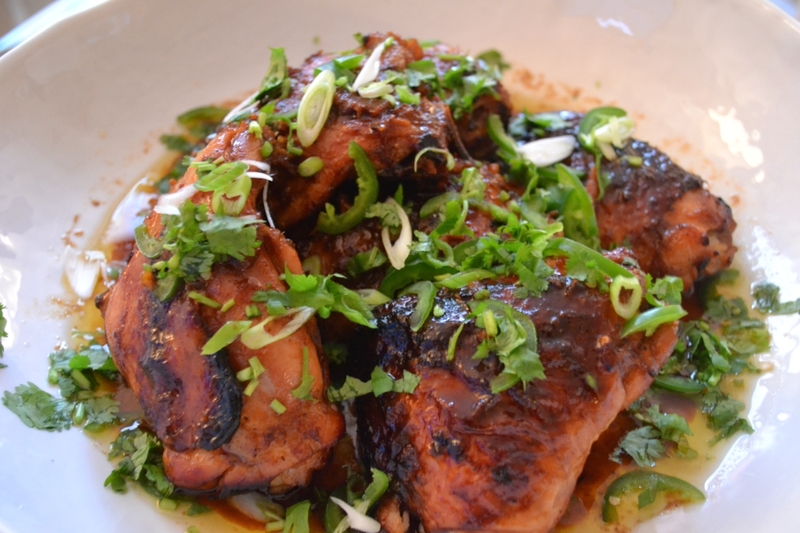 I promise you a chicken like never before, honey sriracha, tangy with a kick. Now enough of my ranting and raving, GO! 2-3 pounds chicken legs, thighs and/or wings. In a large non-reactive bowl add all the ingredients for the marinade and mix well till they are well combined. Add the chicken pieces and toss well to coat them all with the marinade. Let the chicken marinate for minimum 30-45minutes at room temperature or in refrigerator if keeping for longer time. Toss the chicken at-least once while marinating. In a large baking-dish/baking-sheet place the marinated chicken pieces in a single layer along with all the marinade. Bake until the chicken is cooked through and the sauce is thick, 40- 55minutes. Flip the chicken 1-2 times while baking to ensure even baking. This sounds delicious.. Love the sweet and spicy flavors going on here! Thank you so much Mr & Mrs P. I love sweet and spicy so its the perfect recipe for me! That looks like one fabulous sauce! Oh trust me, it really is! Julia- is the chicken skinless? I need idiot proof instructions!! Hi Dalia, The chicken is not skinless – when you cook the chicken, the skin will get crispy. However if you’re not a fan of chicken skin you could remove it and do the recipe without it. Julia – I love reading your blog during boring work calls. Shhh – don’t tell anyone 🙂 This looks amazing – I’ll have to try it. And, you’ll be happy to know that I am a die-hard chicken fan. Thank you Laurel!! Your secret is safe with me! This is the third time I’m making this chicken, I love it! Allison, that makes me so happy! Glad you like it!